Similar to our Glass-Encased Bubble Series, this series features delicately-trimmed crystal droplets that resemble snowflakes. Every crystal droplet reflects light upon each other and creates sparkling illumination. 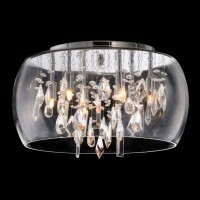 Available as a single pendant, multiple pendants on canopy, wall sconce, or ceiling mount in Chrome finish.